Norman has an art studio in Lincolnshire where he holds classes, workshops, demonstrations and exhibitions. 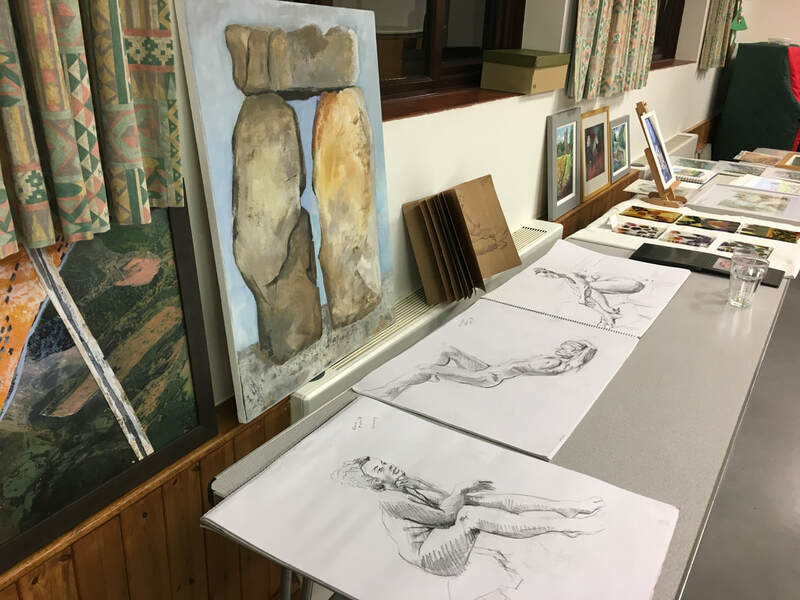 He also travels all over the UK giving demonstrations and workshops to art groups and societies and on Friday, 12 April 2019, he visited our Society. 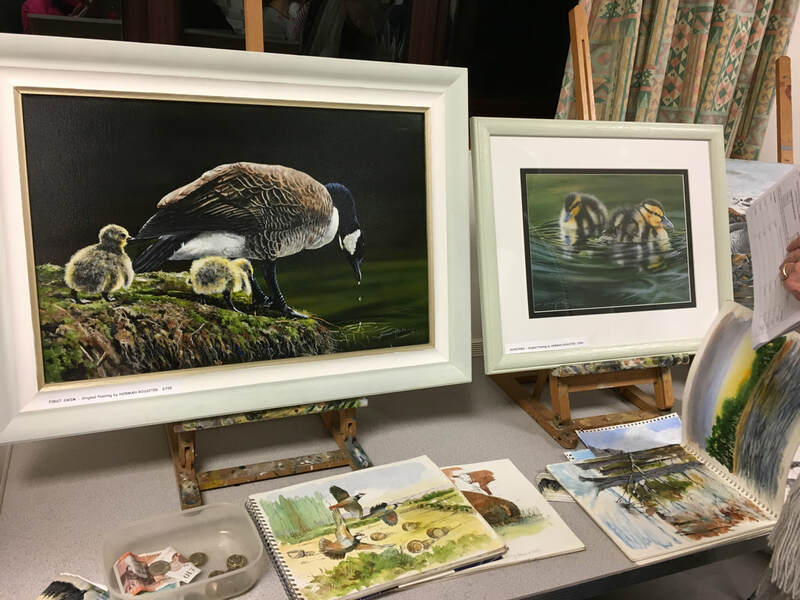 He is a full-time professional artist specialising in wildlife, landscape and the countryside with wild birds being a favourite subject and utilises mixed media ie., acrylics, oils and pastels. 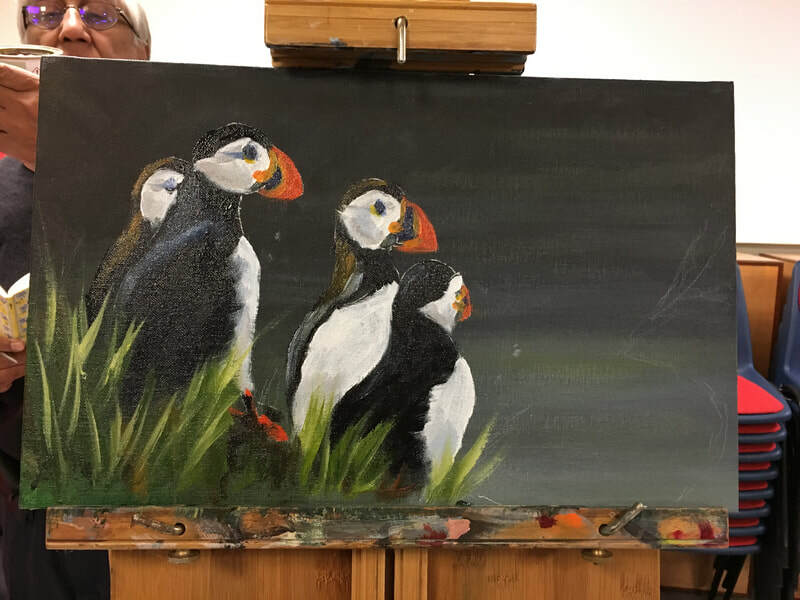 Below are paintings of Puffins and a Widgeon which Norman demonstrated to us during the evening. Thoroughly enjoyable evening. 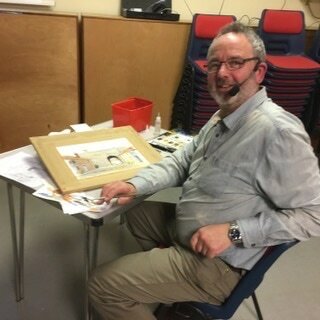 A thoroughly enjoyable evening learning about paper cut art. 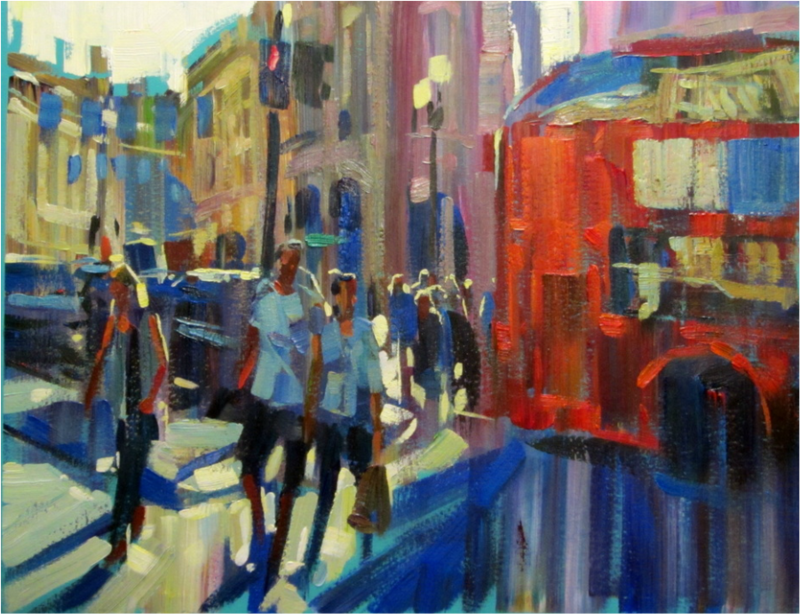 Ian Penney has unending imagination and patience to achieve his wonderful artworks. 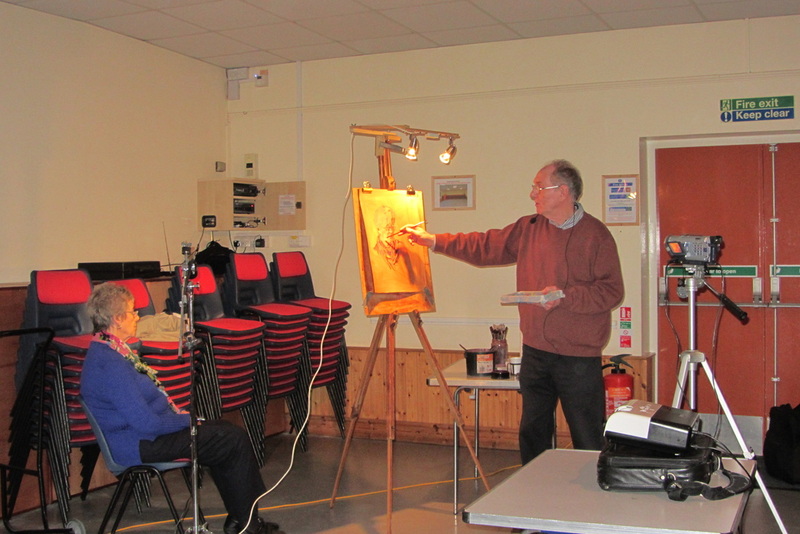 He gave us a thoroughly enjoyable talk and demonstration. Graham is known for producing miniature pieces of art, and is considered one of the world's leading exponents of micro-art. In 2012 his nine-month project 'Cutting Edge' showing the words "Nothing is Impossible" engraved along the sharp edge of a Wilkinson Sword razor blade attracted much attention from the media, which led to him appearing in news features internationally and becoming the subject of a Discovery Channel documentary. 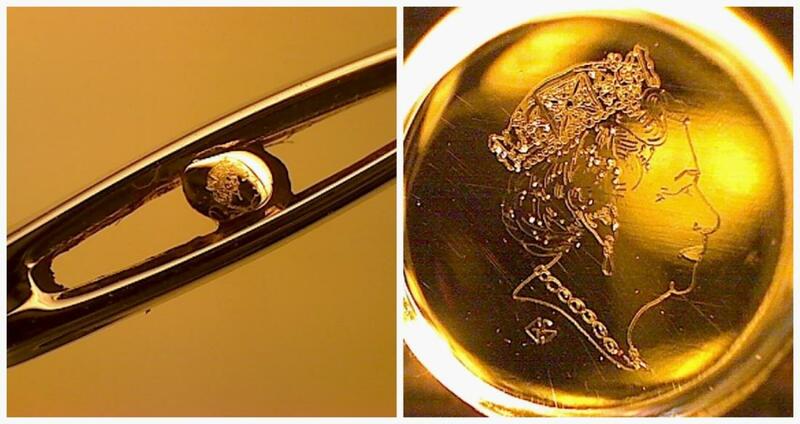 During the same year he engraved a minuscule portrait of the Queen on a speck of gold inserted into the eye of a needle to celebrate the Diamond Jubilee of Queen Elizabeth II. 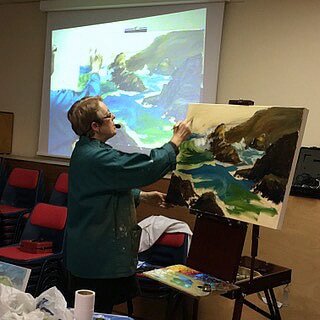 Our first visitor this year was Melanie Cambridge who demonstrated how to draw and paint horses using gouache. 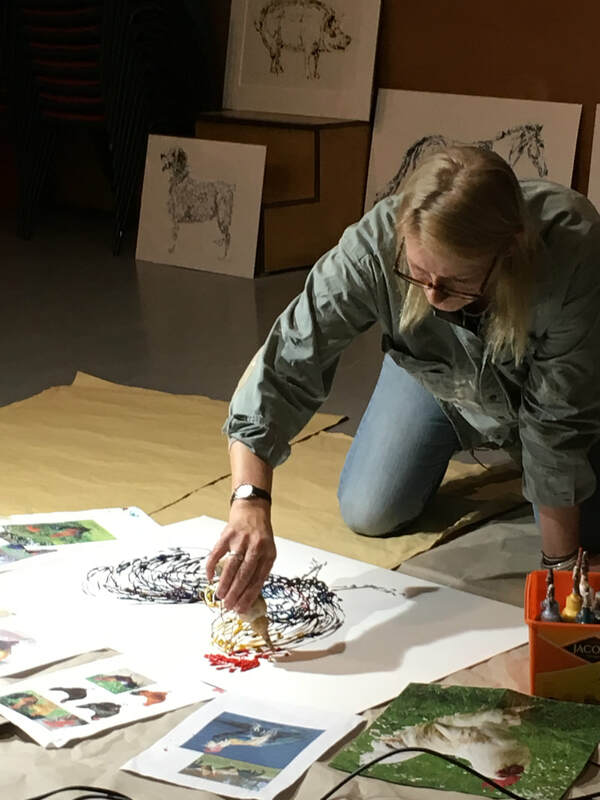 In the first half, Melanie went through the basics of drawing horses and explained how to get the proportions correct by considering the muscle structure. After laying the foundations she painted a horse's head and shoulders. See photos side and below. 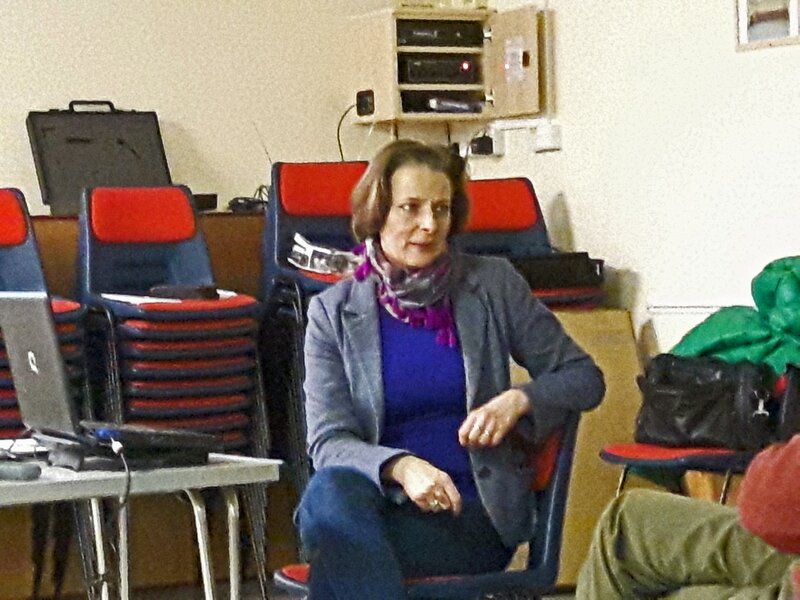 Attendance was high and we had two new members and some visitors. 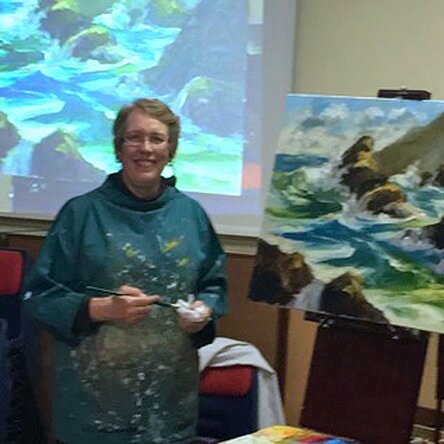 ​Melanie has visited us previously and she is an interesting and entertaining artist. A very good evening and a good start to the year. On Friday, 30 November, we held our annual Christmas Social Evening. 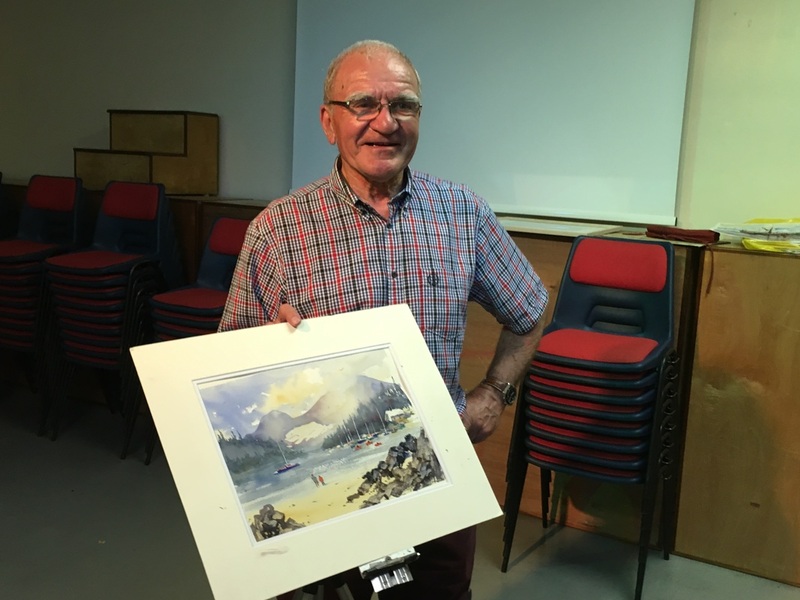 This year, Nick Hampshire (a long-standing member) kindly agreed to give us a short talk about his life and work as a restorer of fine art and as an art dealer. This was extremely interesting and at times amusing. 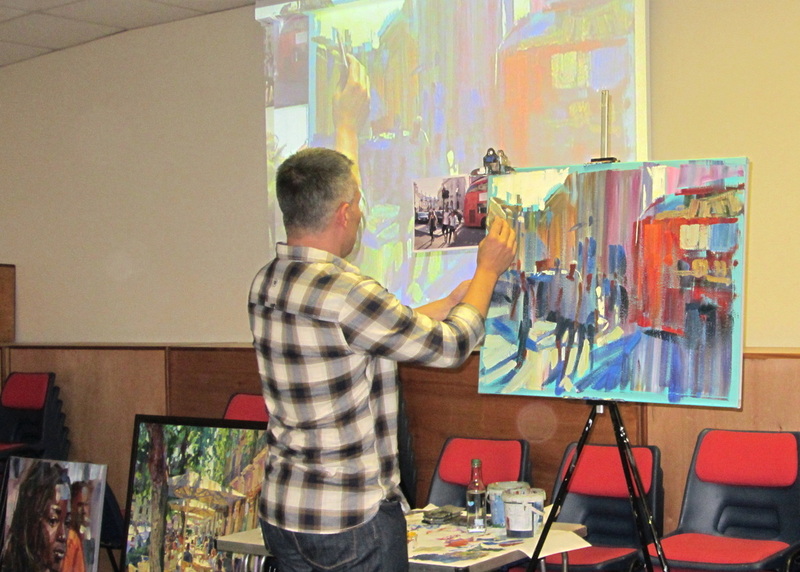 He showed us ‘before’ and ‘after’ photos of some of his work showing how some paintings are completely transformed. Many thanks to Nick for this. 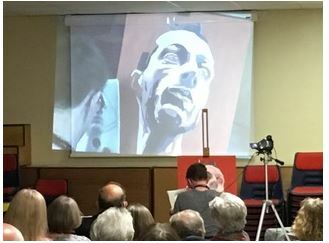 Excellent talk/demonstration by Becky Mair. One long standing member remarked that it was the best demo he had seen. Sonia Bacchus (above) has demonstrated for us previously and we were glad to welcome her back. 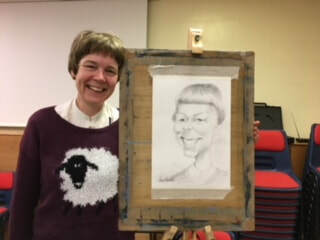 This time she demonstrated how to produce caricatures and Alison kindly agreed to be the model (right). We all thoroughly enjoyed the evening. 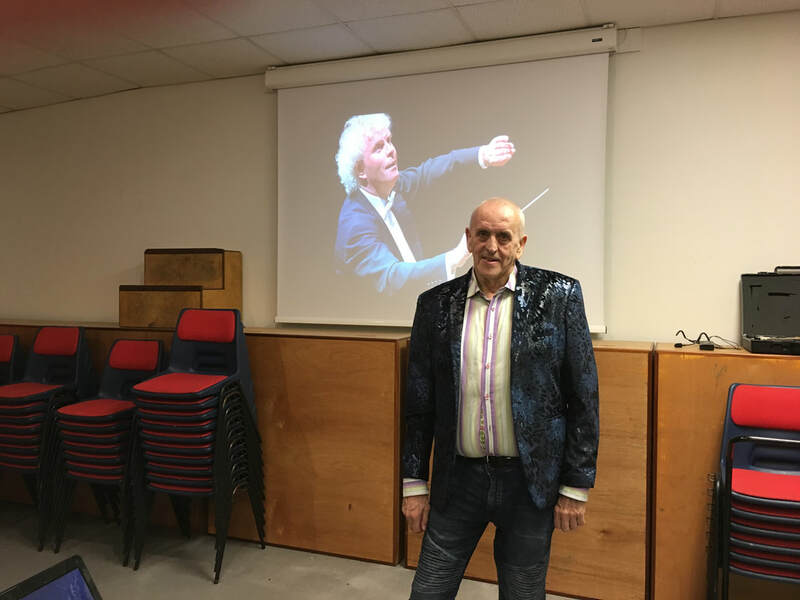 ​There was a good attendance comprising regular members and some old friends and it was agreed that the evenings just get better. Diane Hayes and Pat House provided the food again which was great and there was a raffle. 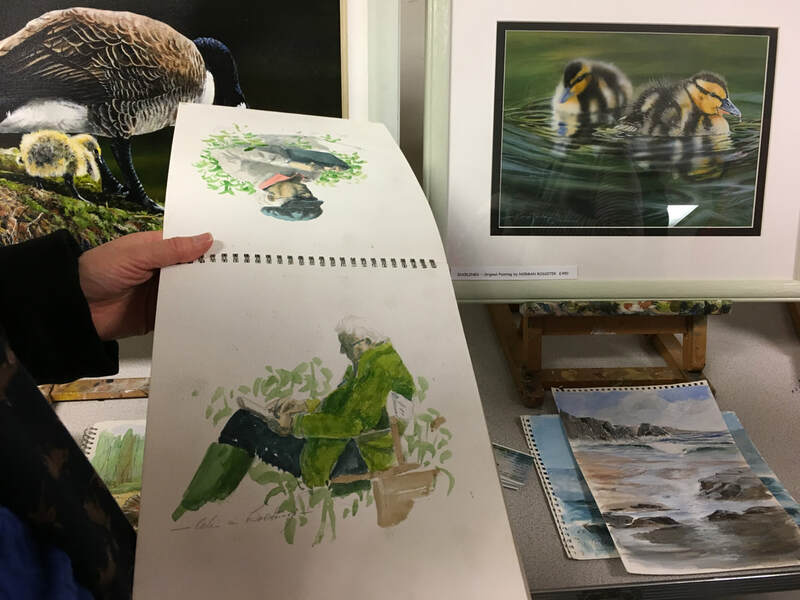 Some members brought along work that they had been working on during the year, some of which was created at some of our events i.e., painting out days or freestyle evenings. 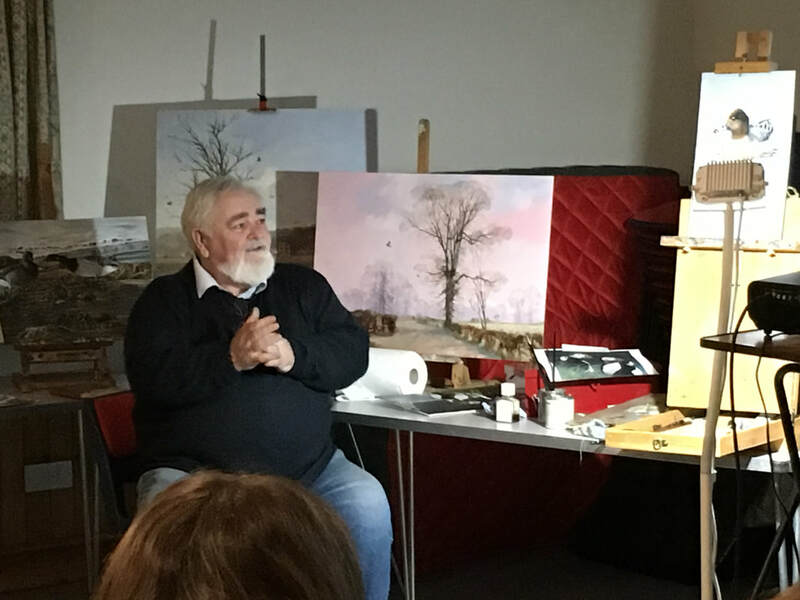 ​10 March 2017 - Melanie Cambridge gave an interesting and sometimes amusing demonstration that you can create an oil painting in about 1.5 hours on a 3 foot wide canvass! 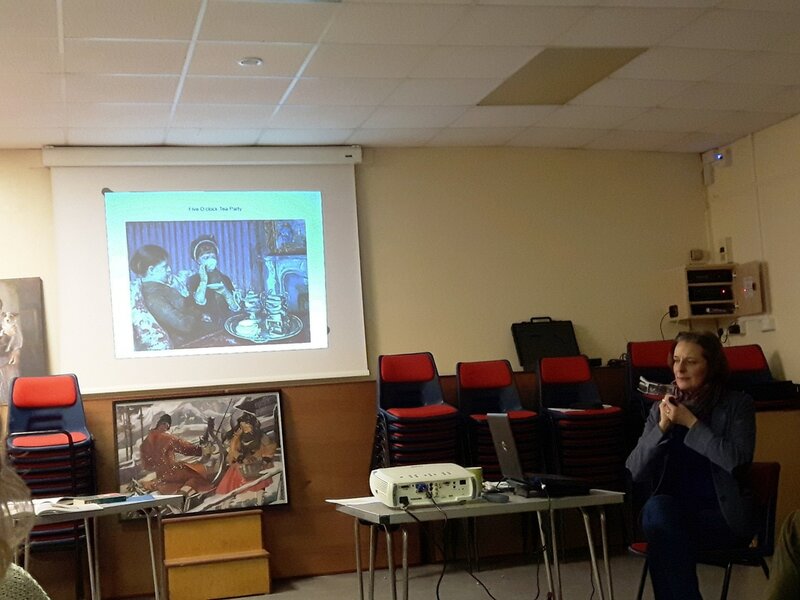 On the 10th February, Sonia Bacchus (2 pictures below) gave a very interesting illustrated talk about women artists throughout the ages. This was well received by everyone. 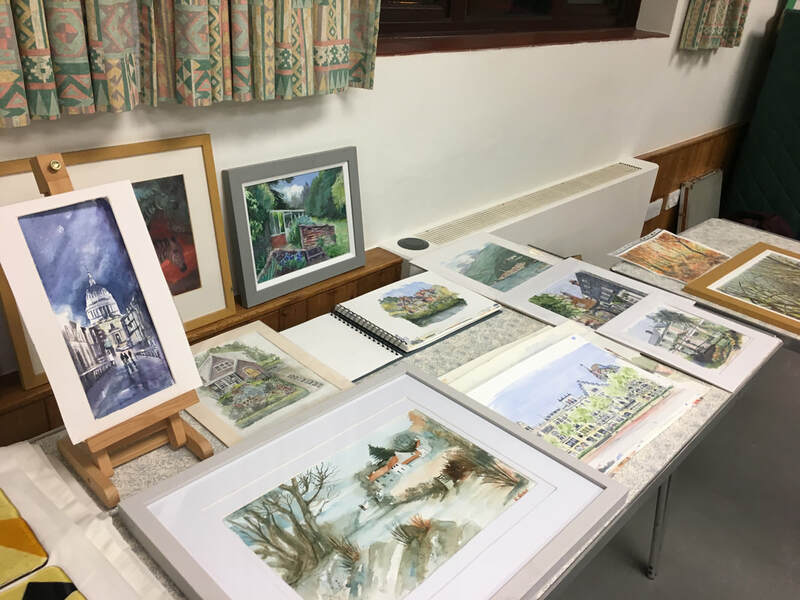 Our first Friday evening meeting this year(2017) was with Anthony Nield (below). 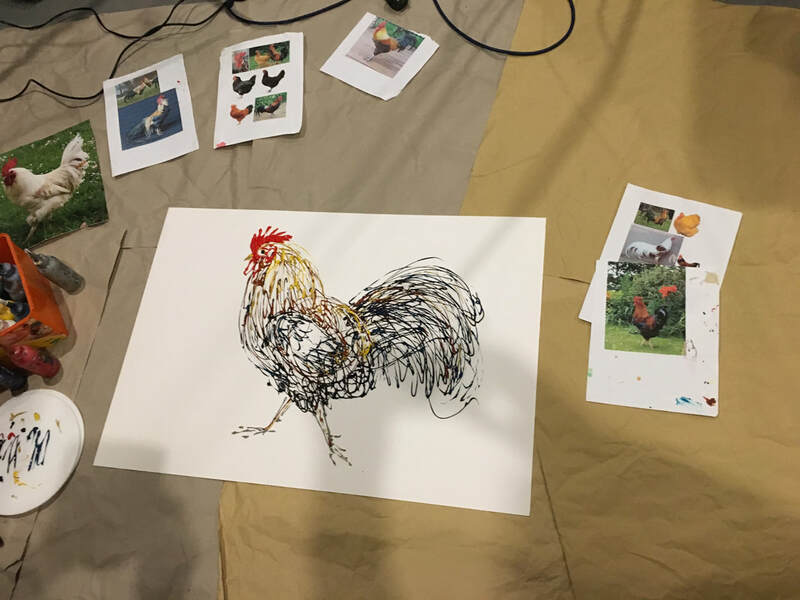 He handed out copies of his original sketch so that we could follow step-by-step in conjunction with the overhead screen. The demonstration was a great success and Anthony's narrative was both instructive and amusing. There was a good turnout from the membership despite the icy evening. Images below are from the 2016 season of Friday demonstrations. 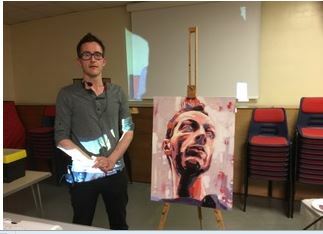 ​On 14 October, Paul Alcock (pictured with almost finished work) gave a demonstration of using acrylics. 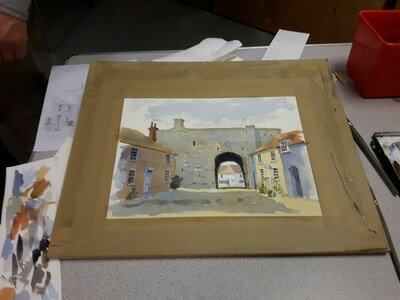 He reproduced a street scene from a photograph. 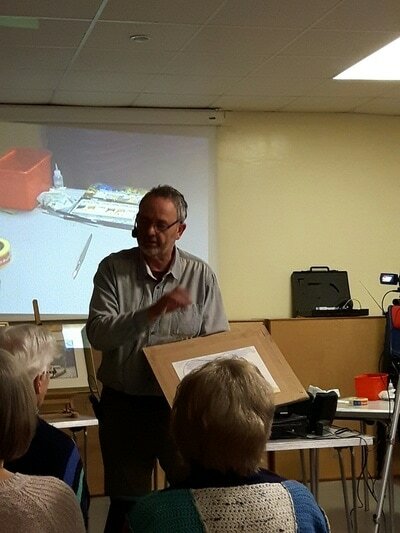 On Friday, 13 May, Peter Robson kindly stepped in at very short notice to give us a watercolour demonstration. 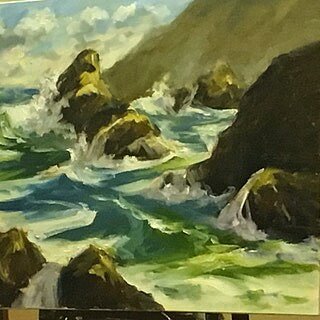 His style is very unfussy and he paints very quickly. Please see the excellent mountain scene below. 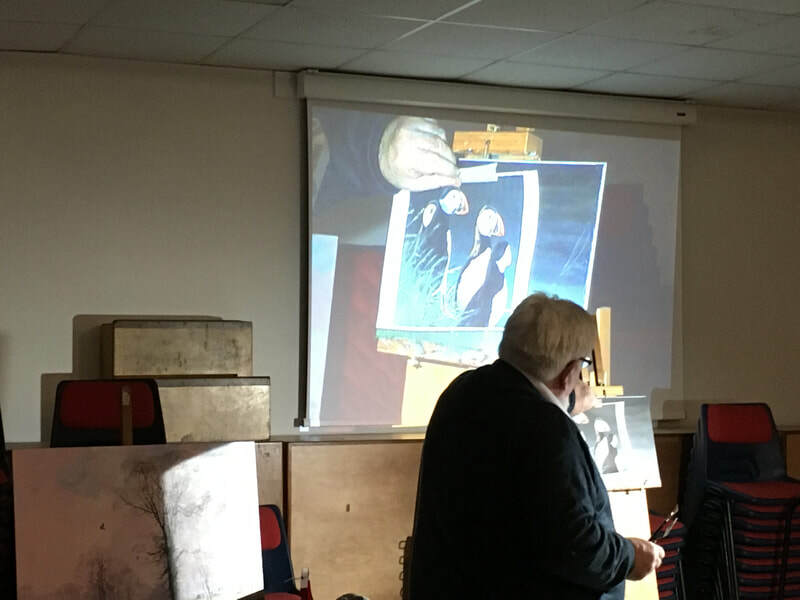 On 8 April, David Aspinall (below) gave an incredibly interesting and entertaining demonstration of a street scene using watercolour. David made it look so easy and he so obviously loves this medium. Really good evening. 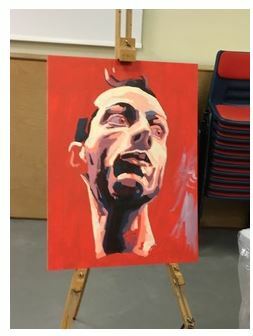 On Friday, 11 March, Keith Morton produced a preliminary portrait of one of our members, Sue Smith. 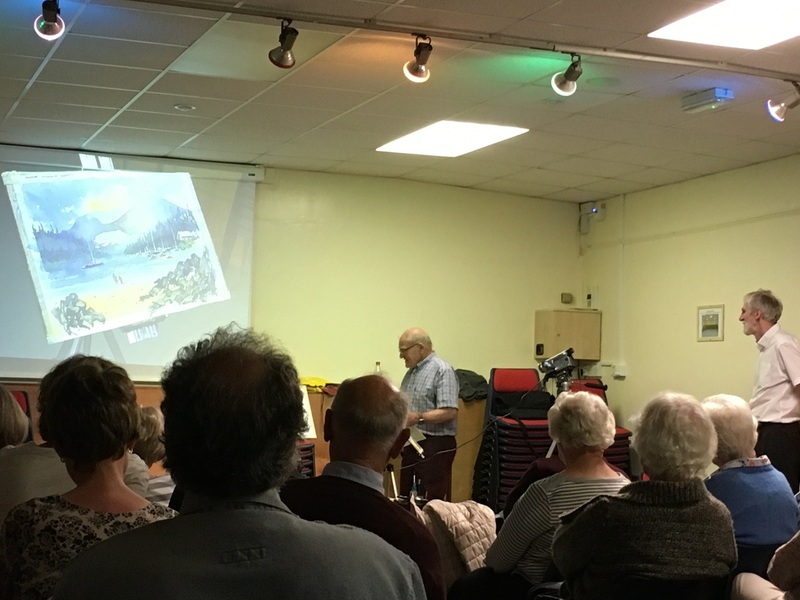 Attendance was high and Keith's performance was applauded. 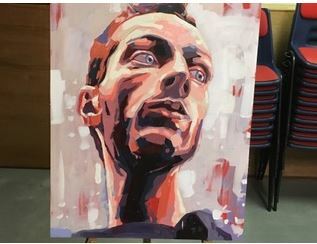 Afterwards, he handed the painting to Sue. 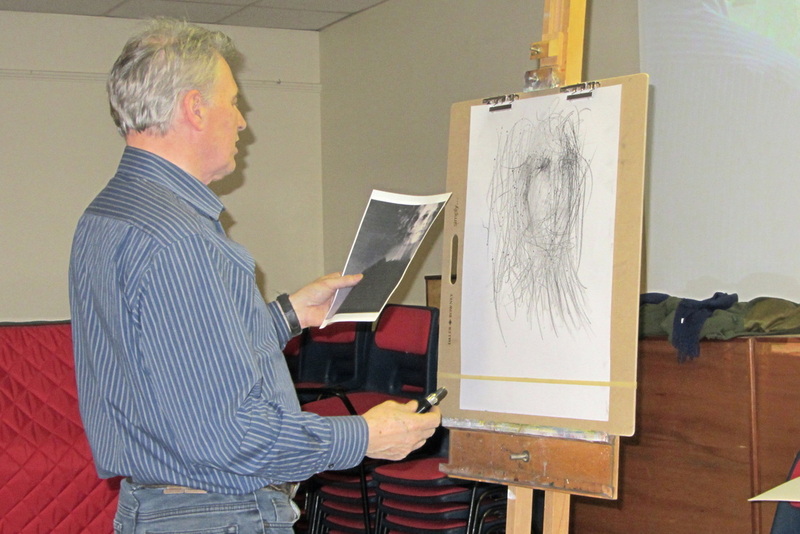 On 12 February, Ronnie Ireland gave a very different demonstration on the use of pencils and charcoal - to great effect. Shown below. 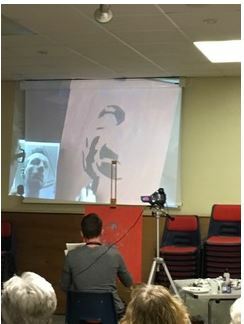 Our first demonstration for 2016 was with Joel Wareing who used soft pastels in an urban setting. Shown below. 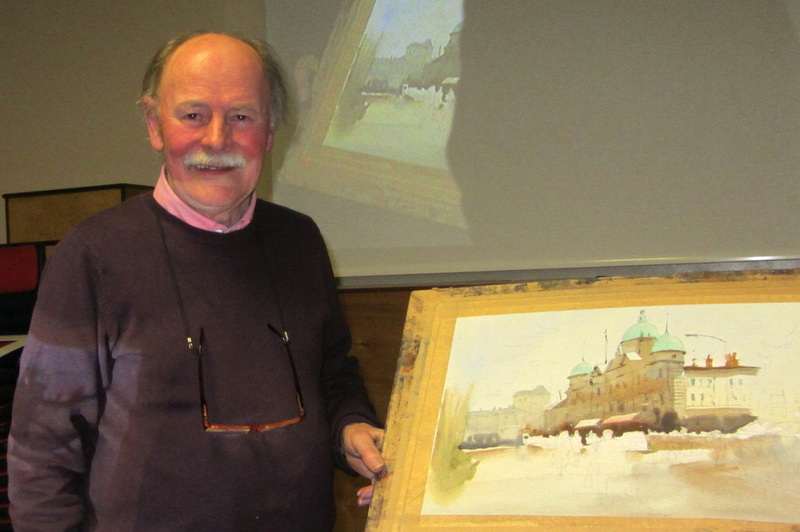 On Friday, 13 November 2015, Stephen Cheeseman demonstrated how to use watercolour in an impressionist way. He drew a horse race from a newspaper cutting and explained in detail each of the steps he took. The final result is as below. Attendance was high again and everyone enjoyed the evening.